Below is a 1 hour chart of the YM. 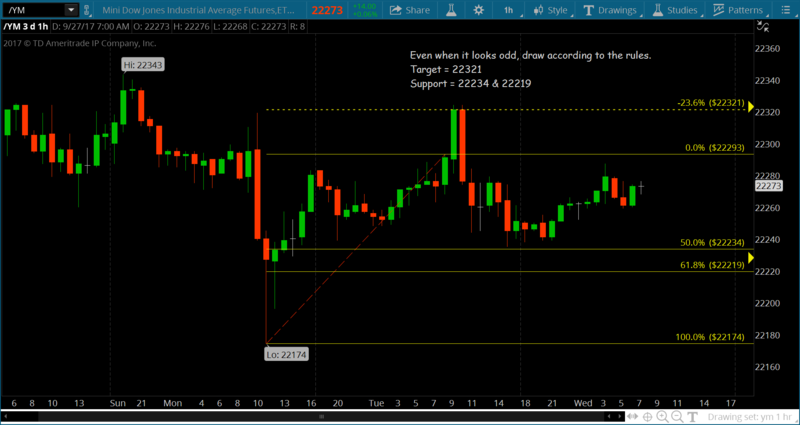 Even though the draw looks somewhat odd, you’ll see the target of 22321 was hit twice. On the pullback, support also held at 22234 – 22219. Keep in mind these are the first Fibonacci draws of the day & will change throughout the day. These first draws are intended to get you started with the correct starting point in the morning. Draws are updated all day in our live trading group. Always use a stop and have a great day ! All the futures are in synch now with upside targets. This past Thursday China’s flash Markit/HSBC Purchasing Managers’ Index (PMI) came in at 49.6. When this number drops under 50, it signals an economy is no longer expanding. This appeared to be the catalyst that triggered the US markets pullback. And I think that’s all it is, a normal pullback. The first trading day of 2014 the markets pulled back and created new downside targets.